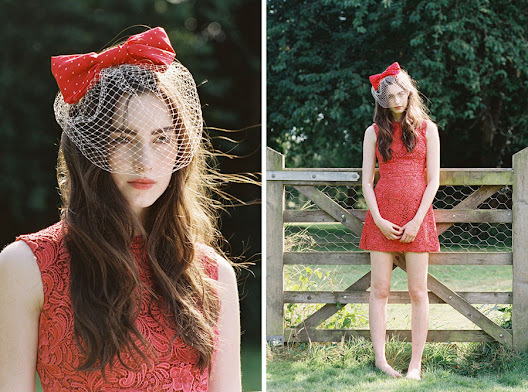 Morven (Premier Model Management), Surrey, August 2012. 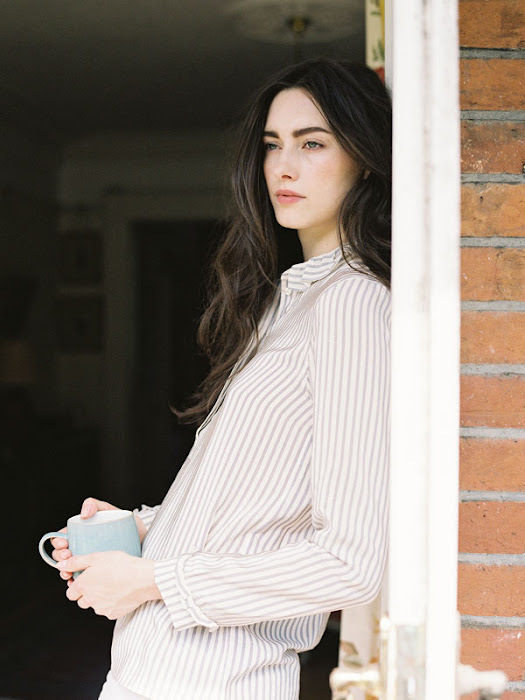 A little shoot that I did back in August with beautiful Scottish model Morven and styled by talented designer + stylist Verity Pemberton with gorgeous hair & make-up by Jessica Mejia. The shoot day turned out to be the hottest summer day this year so we were all positively melting especially Morven who was a trooper when we put her in heavy winter pieces (the vintage swimsuit was a lunchtime cool-down treat!). oh, that turquoise sweater accentuates the color of her eyes perfectly!.. Vanessa, I admire your photographs for a long time, especially the colors and depth.. Do you shoot with a film camera? Most of pictures have this soft grain and well-balanced colors, very true, that's why I had this thought. I love these, absolutely beautiful! My favourite are the ones with the teal jumper, such a beautiful colour. The light is so soft and bright. Oh my goodness she's like a Brooke Shields cross Jennifer Connelly cross Ali Michael. And I need that Carven coat. she is so incredibly beautiful. stunning shots. You NAILED the lighting. Awesome pics. That green sweater with the bug pins is so fab!! what a great idea. @Kate -isn't the green sweater gorgeous? All of us were ooohing and ahhing over the sweater with the bugs - we all wanted to purchase it but the bugs were all clever Verity's idea! I think she should design a sweater for UO exactly as she has done it here. And yep I do :) Expensive habit! @Ron McQuade - thanks so much. Yes, that is my favourite as well. It was SO hot, and that was shot inside a conservatory (which functions like a hot house) so poor Morven was heating up (and she had the flu!) and I had sweat running in rivers down my back. Plus there was a red umbrella which was giving off horrid reflections in the sun. @Millie - thanks Millie - she is beautiful, isn't she....And she is so, so nice as well. @Anise - the lighting was a complete nightmare. It was SO bright and harsh and the green grass was reflecting onto Morven's skin especially her face....and we didn't really have permission to shoot inside. Anyway, we muddled through it. @Kat - Yep, the bug sweater was all Verity's idea! Genial la idea de los insectos en el pullover. 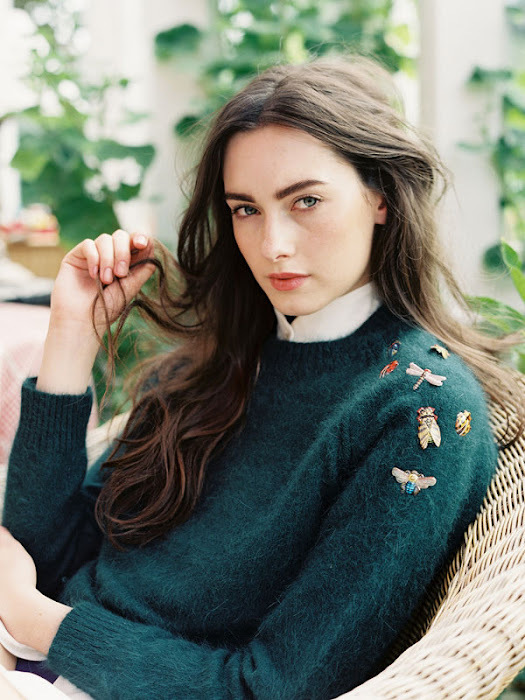 Loved the green jumper with dragonfly details. @Rachelle and @Constance - thanks so much! @DF - all Verity's idea! @Lola - I know, doesn't she have beautiful skin?! Perfect English rose skin! The pictures are so fresh and beautiful. Loved the styling! gorgeous. morvan is lovely and i am blow away by the simple styling. those brooches! @Clementine - How are you Miss Clementine?!!!! I know right, Morven's face is just so beautiful! I'm fine !! Working a lot, life is good :) Let me know when you'll be back in France ! 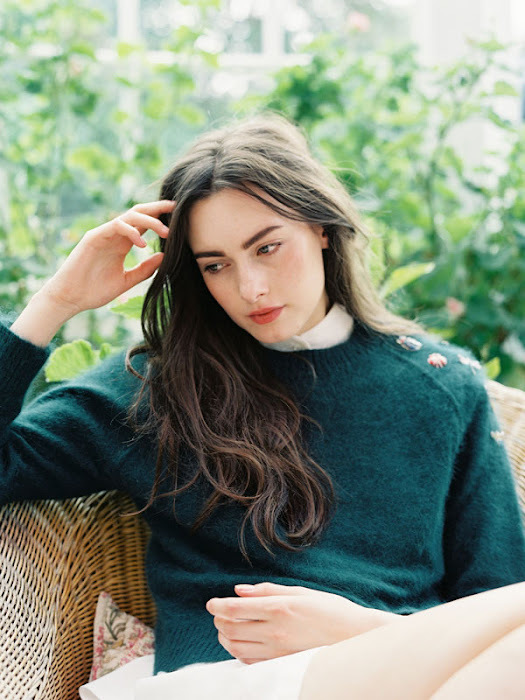 The clothes are absolutely dream worthy...I most definitely need to get my hands on that green sweater, that red dress, and just about everything else Morven is wearing! 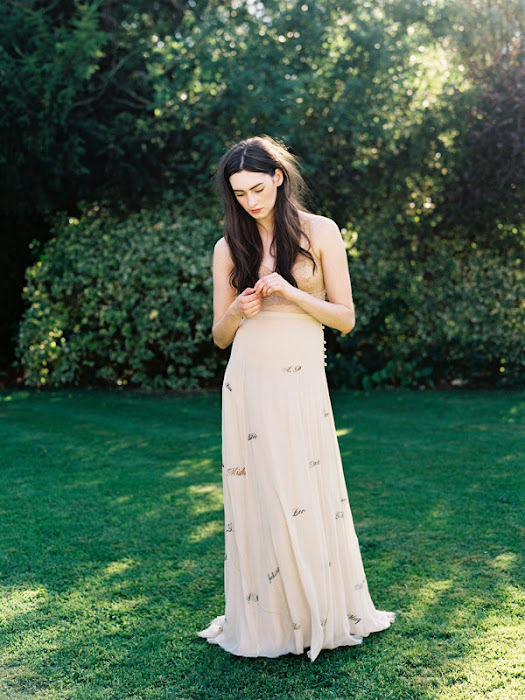 Each piece is so lovely and elegant looking--it all looks so at home amongst the lush green grass and the natural beauty of the wonderful world we live in. Speaking of natural beauty, how do I even begin to talk about Morven? That girl is PERFECT. A perfect complexion, luscious dark hair and eyebrows, sparkling blue eyes. How much more beautiful can you get? Clearly, Morven was a marvelous fit for these clothes. She makes them seem as if they are from some beautiful past age in the rolling countryside of England. An age of tea at noon and afternoons spent frolicking amongst never-ending seas of blue skies and delicate wildflowers. There's no denying the romantic feel to these photos though. How was her makeup applied?